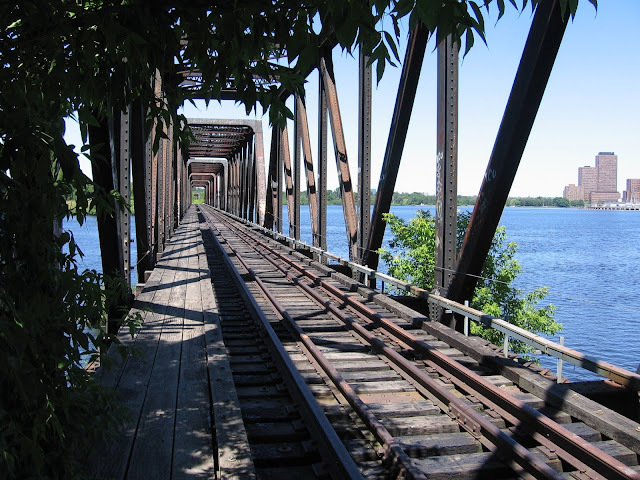 One of my favourite railway spots in Ottawa is the Prince of Wales bridge across the Ottawa River. The bridge was originally opened in 1881 by a railway known as the Quebec, Montreal, Ottawa and Occidental Railway. The following year, the Canadian Pacific bought the QMO&O and took control of the bridge. In 1927, it was rebuilt to accommodate newer, heavier loads. For decades, it was a vital link along the Canadian Pacific Railway's national network, when that network operated through Ottawa. The bridge connected CP's Ellwood Subdivision in the Ottawa area with the railway's Maniwaki Subdivision from the old City of Hull to Maniwaki, Que. In recent years, the fate of this bridge has taken a few strange turns and its future is uncertain. After the Canadian Pacific ended its operations in Ottawa in 1997, the bridge was in limbo. CP's Ellwood Sub and a portion of its old Prescott Sub were purchased by the City of Ottawa for its eight kilometre O-Train commuter service, which began operation in 2001. In 2005, the city purchased the bridge, which has sat dormant since 2001. The thought at the time of purchase was that the bridge would play a vital role in any commuter rail system in the National Capital Region, which includes Gatineau, Que. Since that time, any talk of extending the O-Train to Quebec has been met with deafening silence or outright hostility. I find this reluctance baffling, since Ottawa and Gatineau already co-operate by allowing their commuter buses to cross the river. There has been talk of converting the bridge to a pedestrian crossing as well. Let's take a short tour of the bridge. As you walk along the bridge (above photo), you will see six spans on the Ottawa side leading to Lemieux Island, in the middle of the river. The island is part of Ottawa and connected to the city via a causeway in addition to the rail bridge. The island is home to a water treatment plant. What you see below is the view from the Ottawa side heading north toward the old City of Hull. The Prince of Wales marquee atop the bridge has been left to the mercy of the elements, like the rest of the bridge. Below: Once you reach Lemieux Island, the first part of the Prince of Wales bridge ends, giving way to a span of overgrown track and an old switch that once led to the water treatment plant. The switch has been left in place but the spur has been severed. Below: As you walk across the island, you come up to the second part of the bridge, which is seven spans long on the Quebec side. Interesting fact: The Ottawa River goes by the name Rivière des Outaouais in French, which is also the name of the region that includes Gatineau. Below: Once you step foot in Quebec, the old Ellwood Sub gives way to the former Maniwaki Sub. This is where things get a little confusing. Since the City of Ottawa bought the bridge and the approaches, this means the City of Ottawa owns property in the City of Gatineau. This section of track is also considered the end of the Quebec-Gatineau Railway, since that railway technically starts at Lemieux Island. At one point, the railway still used trackage near this bridge to access the nearby E.B. Eddy factory, which made paper products, mainly matches. The rails to that facility, now owned by Domtar, were pulled up in recent years. You can also see another old track crossing over the former Maniwaki Sub below. The track has been lifted. Once you walk under the crossover, the tracks will lead you to the old Hull Station, near the Casino du Lac Leamy. The old Maniwaki Sub is owned by municipal governments in the Outaouais region. The municipality owns a heritage steam train operation that goes to Chelsea and Wakefield, Que. That operation has been dormant for several years since the rail line was damaged by heavy flooding. Local officials hope to have the train operational next summer, since the steam train is a huge tourist draw. Locals do cross the Prince of Wales bridge often, but I should warn you that it is not a pedestrian crossing by any means. I did cross it once for the purposes of this blog, but as a public service, would advise you not to cross it yourself. Beachburg Subdivision Update: Please see my post from earlier this week for an update on the fate of the Beachburg Subdivision. Thanks for bridging my gap in knowledge about this bridge, Michael! Looks like an important link that may(???) live on. I understand there is a disparity in economic activity and services between Gatineau and Ottawa, which may explain the lack of political will to link by means of transportation other than buses. Very intriguing,I can see the bridge from my place always wanted to see that perspective!! Fingers crossed for its continued use, partisan politics is no excuse..